To me Veterans are Very Important People so I decided to play "Take My Breath Away" from the movie "Top Gun" for these men and women because they are the TOPS in my book. I have tons of photos of Veterans I know. Here are some of them. Click on the photos to see the larger version. 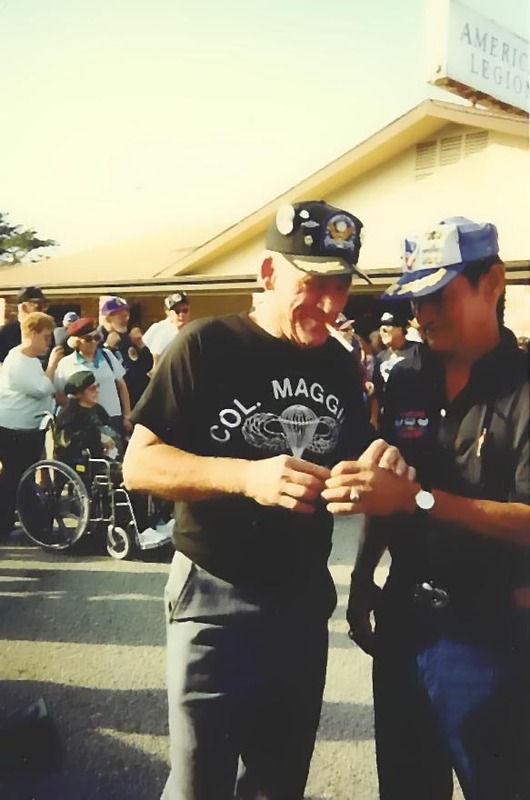 When I first got involved with researching COL Maggie's life I began meeting Veterans from all walks of life. In May 2006 once again I moderated a group of Veterans for Tim Burchfield's documentary. This time the Vets had served in Vietnam. Here are some of the many photos taken that day as we were gathered together in Schenectady, NY. The left photo shows from L-R Mary Reynolds Powell--a nurse in Vietnam, Noonie, Ann Kelsey--an Army Special Services Civilian Librarian in Vietnam, and Kathleen Fennell--another nurse in Vietnam. The right photo shows Carey Spearman--a combat medic and X-Ray Technician in Vietnam with Noonie. Photos by Terry Waterston. In November 2005 I finally met Kimberly (Hartman) Dooley who had served in the US Coast Guard. Her mom, Robin Hartman, took this photo of Kim and I when I spoke in Philadelphia at the Naval Support Activity for Veterans Day. In October 2005 I had the privilege to interview four women who served in Iraq with the NY Army National Guard for Tim Burchfield's documentary. I also was able to interview 2 of their daughters. Here are some photos taken that day: (L-R) MAJ Kelly Hilland, CSM Joyce O'Neil, Noonie, and SFC Patricia Bourdeau; the next photo is Noonie, SFC Bourdeau and SGT Leslie Butler; the third picture is MAJ Hilland with her daughter SSG Natima Davis who is a member of the NYAirNG; and the last photo is SGT Butler with her daughter Tiffany. Photos by Terry Waterston. In July 2005 I moderated the 3rd Women Veterans Forum at the NYS Military Heritage Museum. I had women from WW II right up to present day and learned so much this time around. 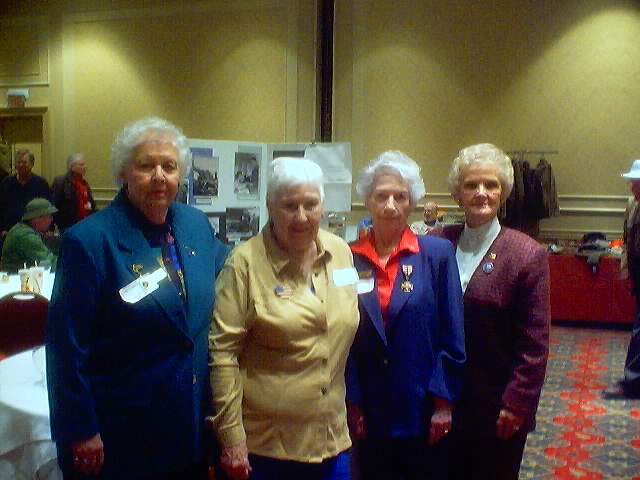 Here are the photos of these amazing women: (L-R) Marie Lombardo USN--WW II, Andrea Hyde Rogers USN--Korea era, Helen Vartigian USA ANC--Vietnam, Jane Knight USAF--Vietnam era thru Desert Storm, Linda Brandt USA--now with NY Guard, Pat Huggins USAFR--Vietnam era thru Desert Storm, Carol Barkalow USA--80 thru 02, Kelly Hilland USARNYNG--Operation Iraqi Freedom. Photos by Terry Waterston. As I mentioned on my Events page I did a Women Veterans Round Table for a documentary. The producer of this program is Tim Burchfield. Here are some photos of Tim, the women who took part in this session and yours truly. The photo on the left shows Rose Stewart (USN--Korea), Kathryn Shaw (Goodman) Frentzos (USA ANC--WW II) and Tim Burchfield. The middle picture shows sitting Doreen (Flatman) Cooper (British Army--WW II), Kathryn Frentzos and yours truly standing. The photo on the right has Lois Bydiark (USN--Korea), Frances Iwanski (USA ANC--WW II) and Rose Stewart. Photos by Terry Waterston. 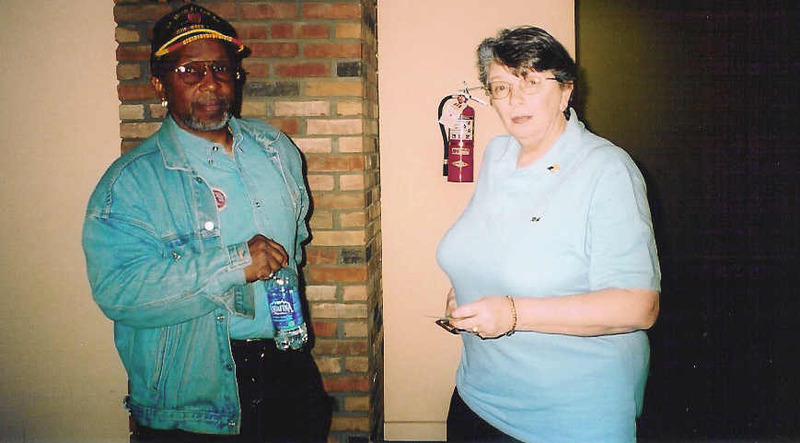 I met Judy Perry at the Tet 68 Reunion in Hampton, VA back in 2003 and again in 2004. Judy became a WAVE in 1959. We had a lot of fun talking during both reunions and she sent me her military info. One of these days I'll get around to writing her story. Photo donated by Judy Perry. One of the men who was influential in actually getting me to meet Maggie first by phone and then in person was Jim Spitz. He headed up the COL Maggie All Airborne Services group that holds a reunion every Labor Day weekend which also honors Maggie and Frenchy. He invited me to Marina, CA in 1990. Jim is also a Veteran. This is him wearing the COL Maggie t-shirt! Maggie is in the background in her wheelchair. Photo by Noonie Fortin. Another man I met that weekend is COL Lewis Millette. 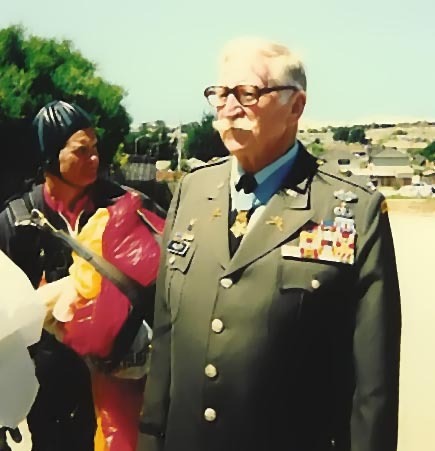 He was awarded the Congressional Medal of Honor for his actions during World War II. Photo by Noonie Fortin. 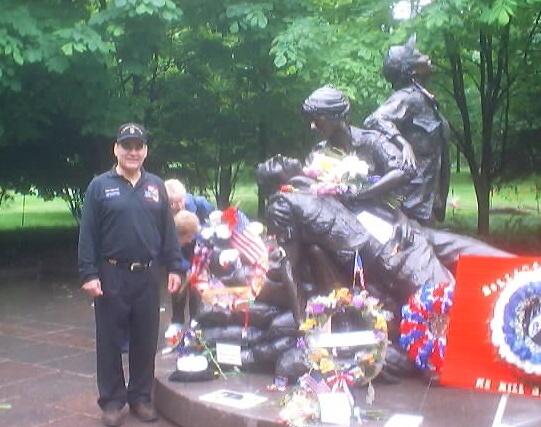 On Monday 26 May 2003 I was once again in the presence of Veterans in Washington, DC to celebrate Memorial Day. One of the people, who I helped become a speaker for the morning, there was John Burnam. He was a dog-handler in Vietnam and has written two books about his experiences during the war. He is now trying to raise awareness to have memorials placed around the country and in DC to honor the brave dogs who saved so many lives during the war. Photo by Noonie Fortin. 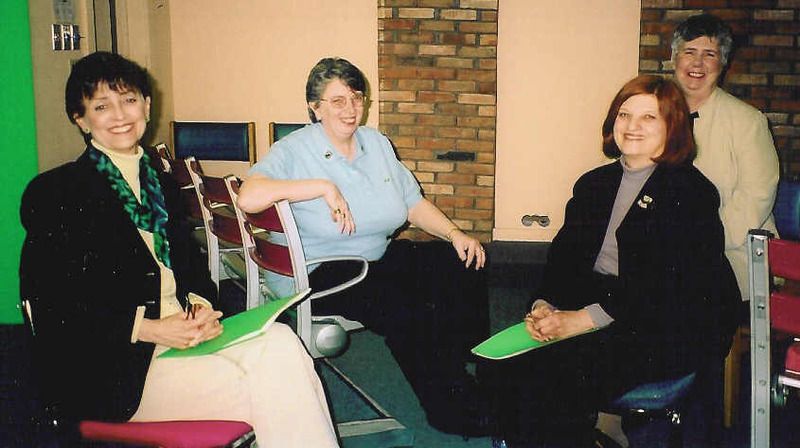 I met these women Vets in November 2002. L-R is Harriett Howard (WAVE), Margaret Salm (WAC--she is in my book Women At Risk), Margery Coventry (WAVE) and Dorothy Carter (WAVE). Photo by Noonie Fortin. I've known this man for some time and have taken several photos of him but for some reason I like this one. He is an Army Veteran of WW II, Korea, and Vietnam. 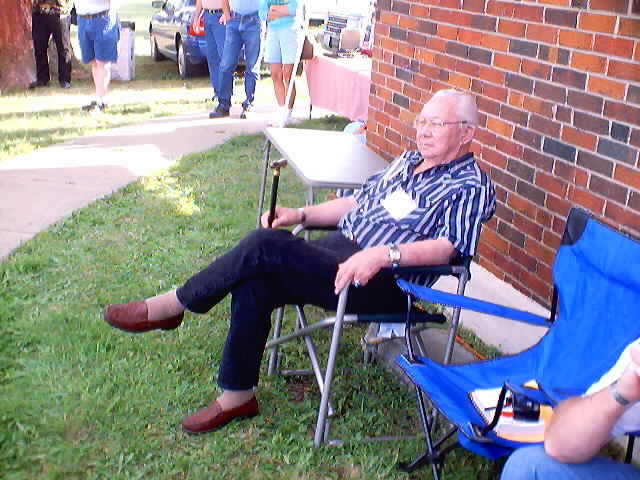 Here COL Earl Hopper is relaxing listening to the entertainment and speakers during Freedom Fest 2001 in Skidmore, MO. Photo by Noonie Fortin. In August 2001 I went to Orlando, FL for the WAC Convention. I knew a lot of folks there but I think this was the first time I had my photo taken with Linda "Scooter" Watson and Cathy Oatman. Both women had been in Vietnam during the war. Scooter was part of Operation BabyLift--she is sitting down. Cathy served 3 years in-country and when she came home she brought 2 beautiful orphans with her. Photo by Pam Waterston. Tampa, FL on 7 April 2001 was a special day. Karen Offutt was awarded the Soldier's Medal for her heroic actions while serving in the Army in Vietnam January 1970. Photo by Noonie Fortin. On 2 November 2000 I was speaking in North Creek, NY. Two of my friends--both of whom are Veterans-- were there and they introduced me to another female Veteran. Shown L-R here are Pam Waterston--Army, her mother Terry Waterston--Marines, yours truly--Army, and Rusty Kotula--Army and Marines. Photo donated by Rusty Kotula. Pam Waterston and one of the forklifts (like what she operated while in the Army and the Gulf War) at the Transportation Corps Museum in Fort Eustis, Newport News, VA. Photo by Noonie Fortin. Every September I go to Skidmore, MO for Freedom Fest. In 2000 I met COL Teddy Bitner whom I had met a few years before at Fort Bliss, TX. Also there was Dawn Lindsey who is active in the POW-MIA issue. It is with great sadness that I update this photo. Dawn passed away on Tuesday 4 March 2003. She lived much longer than her doctors said she would. She will be missed by many Veterans especially those involved with the POW-MIA issues. Photo by Noonie Fortin. One of my favorite pictures was taken on Memorial Day 2000 in Washington, DC. It is of entertainer Brenda Allen (she performed for the troops in Vietnam) playing her guitar on that same day. Photo by Pam Waterston. In April 2000 I went to Melbourne, FL and finally met one of the women I had been corresponding with for a few years. Barbara Derry is one of the women I have profiled in my next book. She served in the Air Force during the Korean War. This photo was donated by Barbara Derry. In 1981 I had the pleasure of teaching this woman to be a Supply Specialist. SSG Aimee Lewis is now assigned full-time to an Army Reserve unit in Iowa. However she had been on Guam and Okinawa since 9/11/01 and I'm very proud of her. Photo by Noonie Fortin. Come back again soon to see more pictures on this page as I slowly get them ready for your viewing pleasure.